Click here for a printable version of this illustration. It is critical that specifications call for a “minimum 1/2-inch depth to a maximum of 5/8-inch depth,” rather than calling for a 1/2-inch deep cut with a 1/8-inch tolerance. 1/8-inch equates to 25% of the milled depth. If a highway does not demand a minimum 1/2-inch depth, contractors will mill shallow 3/8-inch cuts, which will not alert truck drivers and other vehicles drifting off the road. 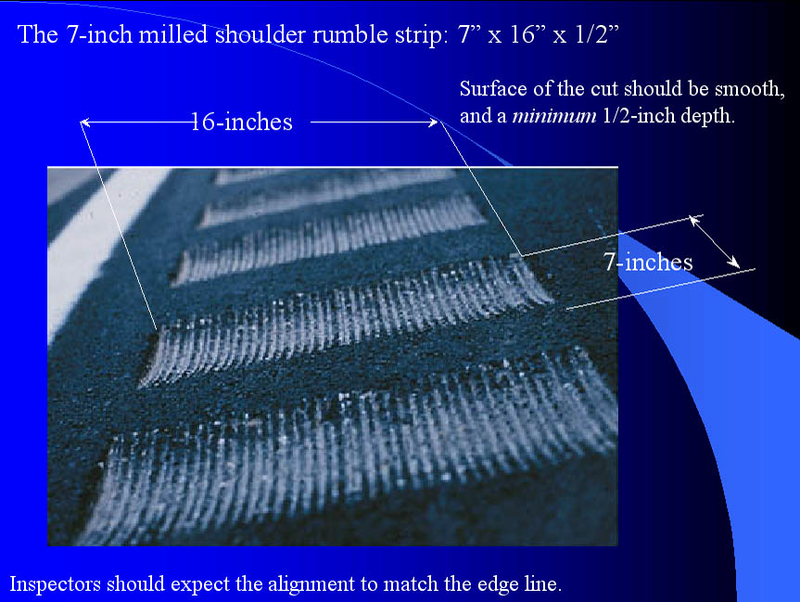 Likewise, shoulder rumble strips specifications should call for minimum dimensions of 7-inches in the direction of travel. Specifications must allow for some tolerance, however, highway authorities should not accept any cuts less than 7-inches in the direction of travel. Large radius tires, such as truck tires, will simply straddle narrower cuts and they will not generate sufficient noise and vibration. Highway authorities have varied the offset of the shoulder rumble strips from the edge line. Some states have placed the rumble strips directly on the edge line (and later painted through the cuts), while others have offset the rumble strips anywhere from 4 to 18-inches. Designers should consider safety, maintenance, and shoulder use concerns in determining the offset of the rumble strips from the edge line. The closer the rumble strips are to the edge line, the sooner they will alert a drifting driver, allowing him more time to recover. From a construction standpoint, the only consideration regarding offset is in those instances where the shoulder rumble strips are placed on a narrow shoulder adjacent to a guardrail or a concrete barrier. In these instances, designers need to make sure they have allowed enough room for a rumble strip mill to work between the location of the cut and any vertical barrier (nearly all mills can fit in areas of 5-feet or more). The air turbulence from the passing traffic keeps the rumble strips blown clear from a build up of debris, sand, or water. This air turbulence decreases as the rumble strips are moved further off the edge line, thus allowing the rumble strips to fill up and become ineffective. Also, rumble strips placed close to or on the edge line maximizes the available usable shoulder. Most states have adopted a continuous layout design for shoulder rumble strips. This has provided states with a consistent and effective layout design, which specifies that the rumble strips be placed on continuous 1-foot centers along the edge line of the shoulder. The skip produces a more alarming sounding that may do a better job of alerting inattentive drivers. The skip pattern requires less milling and so is slightly less expensive. For cyclists who prefer not to traverse the rumble strips when crossing the road, the gap provides them an easy area to traverse. While the vast majority of highways (over 90%) allow contractors to waste the milling debris over the shoulder’s edge, some states require that contractors pick up the debris and haul it off the project to an appropriate dumpsite. Due to the considerable cost of removing the debris from the job site, it is critical that the specifications make clear how the clean up of the debris is to be handled. Specifications which leave it up to the “engineer’s discretion” invariably result in delayed bid dates and addendums until the engineer makes the requirements clear. 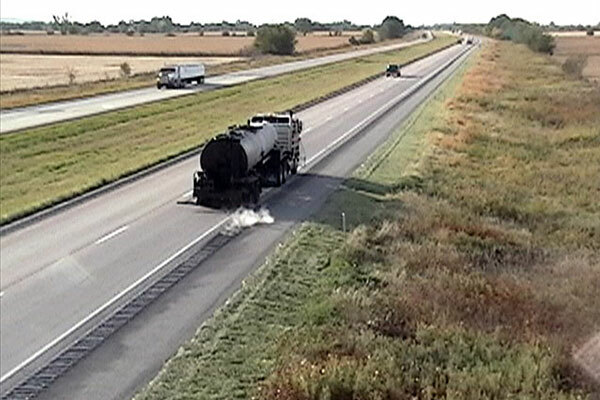 Currently about half of the states installing rumble strips specify that an asphalt-based sealer be applied to rumble strips. The sealers are sprayed over the width of the rumble strip or in some cases across the entire shoulder width. The materials specified normally are a CSS1 or CSS1h, diluted 1:1 with hot water and applied at approximately .1 gallons per square yard. Asphalt distributors can maintain an application temperature of approximately 140° and apply the material at speeds of 8-20 miles per hour. Most hot sealers set within 15-30 minutes after application depending on the application rate, oil temperature, and weather conditions. The sealing process moves roughly 10x faster than the production speed of a rumble strip mill. Therefore, sealing must take place at the end of the project after the contractor has completed construction of the rumble strips. To minimize any speckling of the edgeline with the fog seal material the specifications must offset the rumble strips from the edgeline by 6-inches or more. If fog sealing is planned for rumble strips then consideration must be given to how far rumble strips are offset from edgelines to minimize overspray.